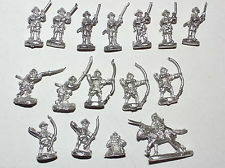 With the new version of Song of Blades and Heroes available and a bargain find on e-bay I thought I would create a new war band based on feudal Japan. These guys who only cost £1.00 will form my Green Dragon Clan. They are 10mm Pendraken figures and the detail is very good. I really like the seated Warlord; I am looking forward to basing and painting these guys. I also have somewhere a small dragon which may or may not form part of this war band. It depends if I can squeeze it in to 500 points. I am going to base the infantry figures on M6 washers backed with magnetic sheet and the mounted figure on a once pence piece. The colour scheme will be green, obviously.